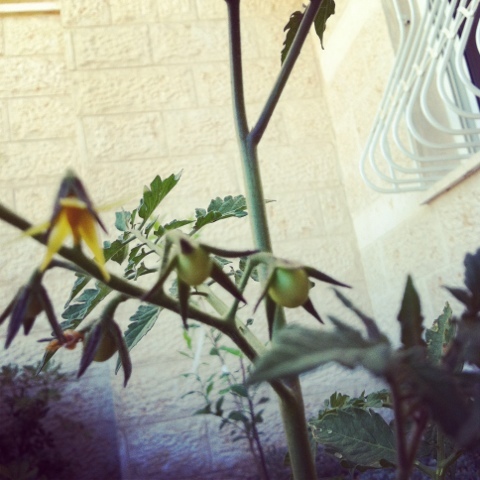 Going Green: How do tomatoes grow? The last couple of months I've been busy carefully watering my tomato plants and watching them grow. I've found the whole experience of growing vegetables from seed to be very inspiring and thought I'd share the inspiration with you. Here's a video that I created with photos that I have taken of our plants all the way, from seedlings to bright green tomatoes. 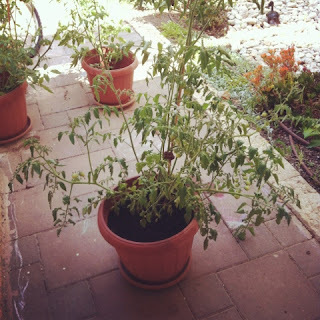 - Next time, I think I'll try creating a tomato cage and not relying on a single stake, which doesn't seem to have done anything to keep this tomato plant from looking like a Xmas tree. - Also, remember to remove sideshoots which are the leafy branches with no flowers that take energy away from the fruit production. - The truss, is the group of yellow flowers eventually whither off, leaving small green tomatoes behind. I read this and other great tomato facts on Tomato Lover. - After a lot of online research, I discovered that inconsistent watering and calcium delivery causes blossom end rot. Unfortunately, nobody seems to agree how much water the plant needs, some say there's no such thing as too much, others disagree, some recommend putting your finger a couple inches into the soil and if that's dry, add water. In the end, I stopped researching and just did what felt right and hoped for the best. (what felt right was watering every morning until the soil looked soaked). Sharing the vegetable growing experience with my kids has been fun and educational but the sharing didn't stop there. We shared the experience with many of our friends in the neighbourhood as after starting the tomatoes from seed, I had too many seedlings, and gave away small potted plants to anyone who came to visit us. The kids even helped me decorate a window container, which we potted up with soil and a small plant for a friend's engagement. You can read about how I got started growing tomatoes from seed in a previous post.